John Wynne's award-winning, often research-led work is made for museums, galleries, public spaces and radio: it ranges from large-scale installations to delicate sculptural works and from architectural sound drawings to flying radios and composed documentaries that explore the boundaries between documentary and abstraction. He has worked with speakers of endangered languages in Botswana and British Columbia and with heart and lung transplant patients in the UK. He is a Professor of Sound Art at the University of the Arts London, a core member of the CRiSAP research centre and has a PhD from Goldsmiths College, University of London. Birds I wouldn’t have heard conveys the impact of disease and transplantation on the daily lives and identity of recipients, live donors and those on the waiting list. This multichannel sound, photography and video installation is part of the exhibition Spare Parts at Science Gallery London until 12 May 2019. 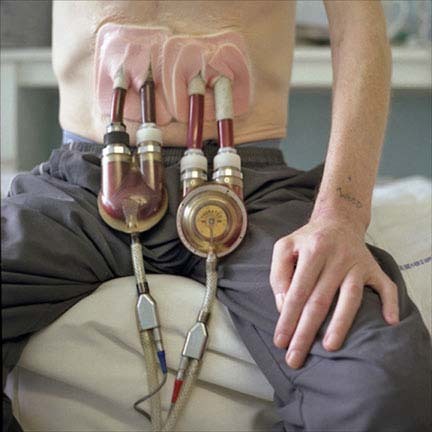 Transplant and Life was a major exhibition of John's collaborative work with photographer Tim Wainwright at the Hunterian Museum in the Royal College of Surgeons, London. Based on the experiences of kidney, liver, pancreas, heart and lung transplant recipients and live donors, it consisted of 3 installations and ran from for 6 months to May 2017. HPNoSS is an interdcisciplinary research project which seeks to provide a holistic understanding of sound in the hospital environment and the intimate relationship of noise to sleep, rest, treatment and recovery. Grave is a sculptural installation using multiple feedback loops which showed at Gazelli Art House, London, in 2015 and at the Wexford Arts Centre in Ireland in 2017. This solo show was the culmination of a research residency in the Atrium Gallery at Bournemouth University, UK. It makes use of an almost 40 year old Atari computer with 1MB of RAM and no hard drive to explore relationships between drawing, architecture and sound. I Am Not the Cancer is a video and sound installation based on women with advanced (metastatic) breast cancer. Developed in collaboration with photographer Tim Wainwright, different versions of the piece have shown in 10 cities, including London, Athens, Brussels, Nicosia, Basel and Dubai. Nocturnal, in collaboration with filmmaker Atom Egoyan. Commissioned for Faster Than Sound by Jonathan Reekie, this is a site-specific installation sited in a former kiln at Snape Maltings in the UK. 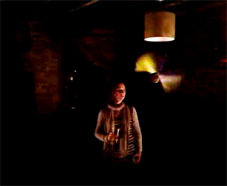 Video, camera obscura and 17 channels of sound. Installation no 3 for high and low frequencies. Gazelli Art House, London, 2014. A massive installation for 300 speakers, player piano and vacuum cleaner developed during an AHRC (Arts and Humanities Research Council) residency at Beaconsfield Gallery in London. 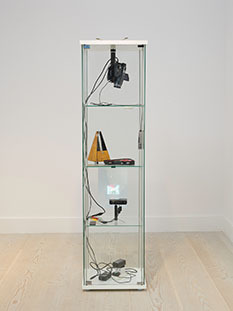 It subsequently became the first piece of sound art in the Saatchi collection and showed at the Saatchi Gallery from June to October 2010. Brandon Labelle writes that the work "creates a soft balance between order and chaos, organization and its rupture". Other installations for discarded but working hi-fi speakers include 230 Unwanted Speakers (Walnut Grained Vinyl Veneered Particleboard Construction), commissioned by Hull Art Lab in the UK. John's first work for reclaimed speakers was Fallender ton für 207 lautsprecher boxen at Kunstfabrik, Berlin. According to one writer, it "sounded like heaven ... and hell". What is What is a collaborative installation with Denise Hawrysio. Combining a drone piece with Hawrsyio's video of holding ice in her hand, the work was made for Frise Künstlerhaus in Hamburg Grermany. Beating Tones and Flapping Wings was commissioned for the 2010 Cut & Splice Festival in London. This two-part installation made use of 40 recycled boom boxes, two radio transmitters and two flying radios. 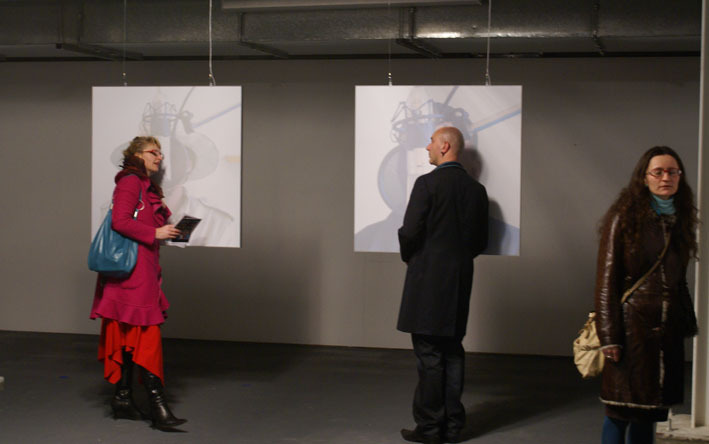 Hearing Loss is a sculptural installation which makes use of the feedback produced by the 6 hearing aids left by the artist's father when he died. Faster Higher Stronger is a 5-channel installation which makes use of publicly visible graphic subversions of the Olympic rings gathered from various sources. Anspayaxw is a large-scale installation based on speakers of Gitxsanimaax, an endangered indigenous language in northern British Columbia, Canada. It has shown twice at the Museum of Anthropology in Vancouver as well as at the 'Ksan Cultural Centre in Gitxsan territory and at the American Anthropological Association conference in San Francisco. The project is the subject of book chapters in Playing with Words and Between Art and Anthropology. Hearing Voices is a body of work based on highly endangered 'click languages' spoken by the indigenous Khoi and San peoples in the Kalahari Desert. 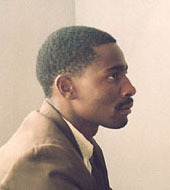 The installation has shown at the Botswana National Museum, the National Art Gallery of Namibia, the Brunei Gallery at SOAS and P3 Gallery in London. A half hour radio piece commissioned by the BBC won the Silver Award at the Third Coast International Audio Festival in Chicago. The Transplant project developed through a year as artist-in-residence at one of the world's leading centres for heart and lung transplantation. Working with photographer Tim Wainwright, we recorded patients, the devices they were attached to or had implanted in them, and the hospital itself. "Both dignified and brutal, the Transplant installation evokes the melancholy and trauma that underpin this uncanny transaction" (The Guardian). A related radio commission for the BBC won the Bronze award at the Third Coast International Audio Festival. Transplant is also a book featuring responses to the project by writers on art, sound, anthropology and medicine as well as a video by Wainwright and Wynne. Andromache, a contemporary adaptation of Racine by Graham McClaren for Necessary Angel and Luminato in Toronto. 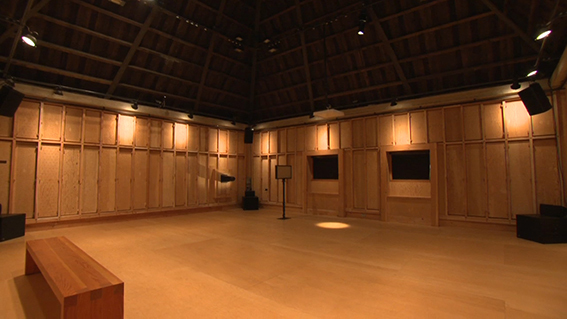 Wynne was nominated for a Dora Mavor Moore Award for Outstanding Sound Design and Composition. Do(n't) was originally an interactive installation for the European Group for Organisational Studies in Barcelona in 2002 and subsequently became a set of 3 text/sound pieces designed for the online journal Ephemera. Two of these pieces played at half-hour intervals on the BBC's Big Screen in Hull in July 2005, but the BBC refused to allow the screening of the third piece, Orange Alert. The Sound of Sirens was commissioned by the Sound/Gallery in Copenhagen. It made use of the gallery's permanent installation of a grid of 25 speakers hidden under the paving stones covering an area of 900 square metres through which several channels of sound could be moved on precise, independent trajectories. Wynne's piece was banned by the City Council of Copenhagen for allegedly frightening and confusing the public. Cry Wolf involved an arrangement of auditory warnings using 25 computer-controlled speakers installed in a vertical grid against the 4-storey central wall of Kiasma, Helsinki's Museum of Contemporary Art. 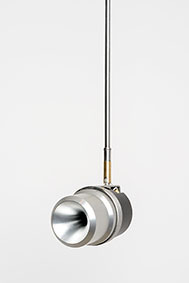 John designed small interactive audio devices for the gallery installation Grasping and Clinging in collaboration with visual artist Denise Hawrysio in Bangkok, Thailand. 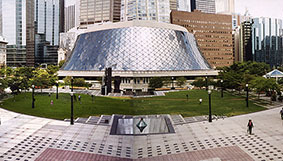 Response Time, a large-scale, site-specific octaphonic installation in the urban park at Toronto's Metro Hall was described in one review as "an ambient, ghost-like presence". Sonic portraits: James Kamotho Kimani, was selected by the International Society for Contemporary Music in Copenhagen, released on CD by Unknown Public and broadcast in Berlin, London, Toronto and San Francisco. 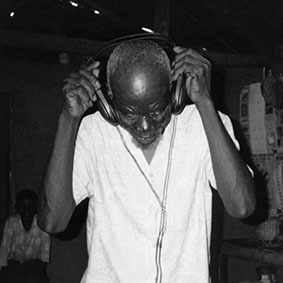 Sonic portraits: Upcountry began as a portrait of Kenyan master musician William Ingosi Mwoshi but became as much about the artist's experience when visiting Ingosi at his home in northern Kenya. The piece premiered in the Purcell Room in London preceded by a performance by Ingosi himself. It was also featured at the AGON Festival in Milan and has been widely broadcast, including on Radiotopia Kunstradio as part of Ars Electronica in Vienna. An ongoing project of what could be described as architectural sound drawings began with an immersive, site-specific 16.1 channel installation in London described by Chloe Vaitsu as "a masterful experiment in controlled sound manipulation, intense and at times looming". The concept was developed during a residency at E:vent Gallery, where Sound CAD was exhibited; Wireframe was made for the Surrey Art Gallery in Vancouver in 2009. For more information, see contact info below. Push comes to Shove is a video/sound installation in collaboration with Denise Hawrysio which premiered at Fieldgate Gallery in London in December 2007 during the exhibition Analogue and Digital, curated by Chris Meigh-Andrews. Feeding the Habit of Energy is a podcast/soundwalk commissioned by RADAR, a meditation on the sonic environment of the huge Brush generator factory which sprawls next to Loughborough train station. It has been played on Framework (Resonance FM, London) and on hr2 in Germany. Interactive Plastic Carrier Bags used small motion-triggered sound devices inside a collection of shopping bags. 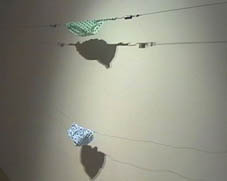 Many visitors ignored the piece, assuming someone had left their shopping on the floor while looking at the other art. Each bag played the sound of its own rustling; the combined effect was like the distant sound of the sea. Work for film and TV includes soundtracks for films selected for the London Film Festival, the BBC Short Film Festival, the Whitechapel Open, the Rotterdam Film Festival and the European Media Art Festival, as well as for the documentary The Trial of Freedom, which aired on Channel 4 in the UK and on CTV in Canada.